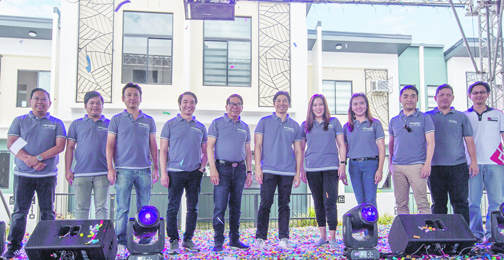 Mass housing developer PHirst Park Homes Inc. (PPHI) recently launched an affordable housing development in San Pablo, Laguna with 1,640 units totalling P2.7 billion. Launch with gravitas. With PPHI show homes as a backdrop, Century Properties Group and Mitsubishi executives pose for posterity. CCPG chairman and CEO Jose E.B. Antonio and COO Marco R. Antonio (5th and 6th from left, respectively) together with (from left) CPGI group head/vice president, Ritchelle T. Cordero; PHirst Park Homes Inc. (PPHI) deputy chief finance officer Humil Nicavera; PPHI EVP for corporate planning and technical innovation Kiyoto Asari; PPHI president Ricky M. Celis; PPHI VP for customer management Loren Sales; PPHI head of legal services Atty. Joy Manaog; Mitsubishi corporation division head Kenichi Kumemoto; PPHI vp for technical operations Kim Amar; and Megawide AVP pre cast division Einstein Chiu. PPHI is a joint venture between the family of former ambassador Jose E.B. Antonio and Japan’s biggest trading house Mitsubishi. Units range from 40 square meters (sq.m.) to 121 sq.m. The Calista Mid has a lot area of 44 sq.m., while Calista End has a lot area of 60.5 sq.m. A combined unit is at 80 sq.m., while the Calista Duo has a lot area of 121 sq.m. A single-detached unit called Unna is at 54 sq.m. Selling prices start at P2.7 million to P3.3 million each unit. PPHI said all the units have the option of having a second floor. The 18.5 hectare San Pablo community will have health and fitness amenities like monkey bars, cross trainers, domical bars, foot reflexology area, and pull up bars. There will also be a clubhouse, swimming pool, water play area, playground for kids, outdoor cinema, and a basketball court. This is the company’s second affordable housing community after the one in Lipa, Batangas. PHirst Park Homes Lipa is a 20-hectare horizontal development in Brgy. San Lucas that was launched in 2018. It is currently undergoing land development, while construction of the first batch of houses will start in September. The project is accessible via South Luzon Expressway through the Santo Tomas Exit and is 15 minutes away from SM City San Pablo. After Lipa and San Pablo, PPHI is set to build more communities in north and south Luzon areas which the company has identified as growth areas with a high concentration of OFW families and unmet demand for housing. Within the next four to five years, PPHI will launch 15 masterplanned communities in Calabarzon and Central Luzon with about 33,000 homes.